We’re always looking for new ways to inspire the next generation of internet users to build on .xyz domains. And that’s exactly why we’re so excited about our new partnership with CoderDojo, the international organization dedicated to teaching students aged 7 to 17 how to code. From now until July 24th, all members of the CoderDojo community can apply for a free .xyz domain and all the tools necessary to create some of their first ever projects on the web. For more inspiration, be sure to visit www.gen.xyz/live to view hundreds more unique .xyz websites from all over the world. 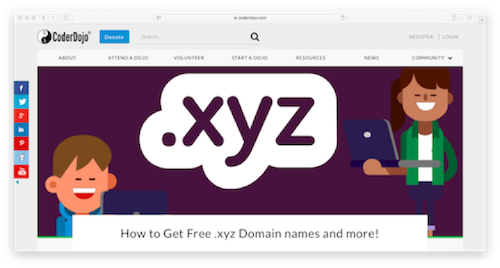 Whether you’re just learning how to code or are a CoderDojo veteran, don’t miss this opportunity to build out your passion on your very own .xyz domain. Remember – you only have until July 24th to claim your free .xyz domain, Weebly website builder, and more. And once you’ve launched your shiny new .xyz website, post a screenshot on Instagram and tag us @XYZ for a chance to get featured in our weekly #WebsiteWednesday series!